It has been two weeks since the awful disaster of mudslides and flooding that struck Tres Unidos and Shamboyacu. Fourteen days of hard work with days that have brought more rain to already beaten down communities. The first few days following November 2nd were long and exhausting. Taylor left early every morning and returned home after dark each evening. His goal each day was to bring hope to the people who had lost everything. He did this by bringing the love of Christ with him. He took the time to listen teach person's story and prayed with them. He also brought in things that were desperately needed water, food, clothes and even a tent for a family who lossed their home. November 3rd Taylor helped organise a truck to bring in drinking water and food to the community. He also went around asking what else the people needed. Taylor also asked the community in which we live to help support the flood victims. There was overwhelming support from the people of Buenos Aires. 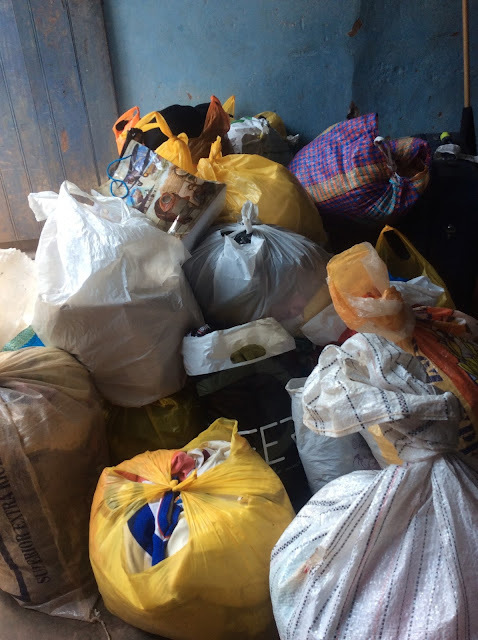 Throughout the whole day on Friday people knocked at our door bringing donations of food, clothes, shoes, blankets, jackets and cooking supplies. I was so touched by the generosity of our community. A few people I spoke with explained why it was so easy to help. They said it could have been them in need and they would want someone to be generous and help. They also explained the great fear they all have whenever the rains come. One woman shared how fear overtakes her whenever she sees clouds forming in the sky. She said the only thing more terrifying is the sound of rain at night. Not knowing if this rain will be enough to bring a flood crashing through her door at 2:00am. Can you imagine living in this constant fear? Our youth group from Buenos Aires and the donations. That evening five members of our youth group came to our house to sort through the items collected. We wanted to separate the clothes into their proper category before arriving the next day. We also wanted to make sure that only the clothes free of holes and stains made it to Tres Unidos. How many items do you think we needed to discard? Just ten items. Only ten of the hundreds we received were not in the condition to be donated. Incredible. The people of Buenos Aires gave the best to the poor. One of the young men sorting through the clothes spoke up. "This is mine" he said as he laid his own clothes on the piles to be brought to Tres Unidos. What a testament and what a beautiful sight. On November 4th Taylor and twelve teenagers from our youth group brought the donations we had gathered. 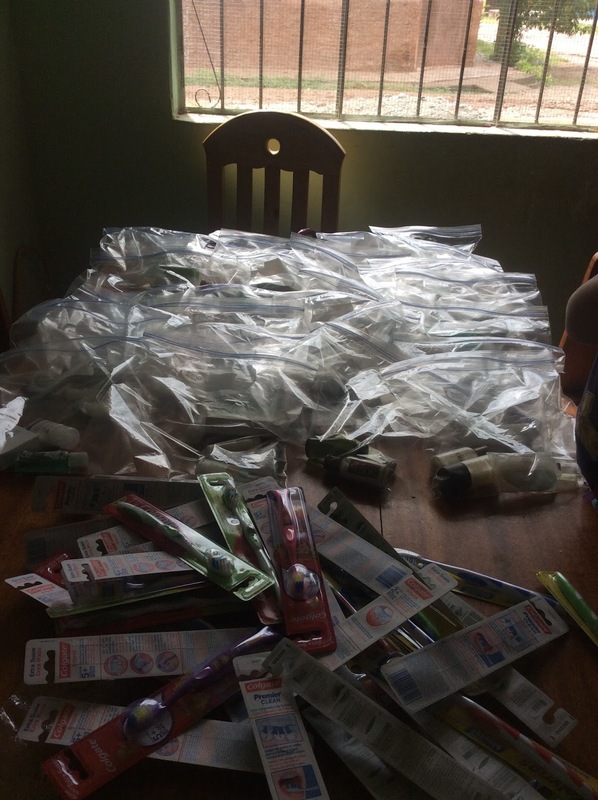 In one day our pueblo of Buenos Aires was able to fill a truck which also included ziploc baggies filled with personal hygiene products to be given out to families. The youth were excited to help not knowing what to expect. For many of the youth this was going to be their mission trip let alone their first time out of the district of Buenos Aires. What the youth found in Tres Unidos was something none of them had seen before. As they pulled into town they came across the house of a family that had six feet of water running through it when the flooding hit. That water took everything they owned but Praise be to God they were able to get to safety before it happened. In the streets everyone had what ever belongings they had left strung out on lines to dry. Somber dirty faces. Half of the youth group stayed in Tres Unidos to hand out the donations they brought as well as to pray with people with some fellow missionaries. The other half left Tres Unidos with Taylor in an effort to get to the man who had lost his family. This man lives in the pueblo of Pairiso which is an hour drive from Tres Unidos. The bridge leading from Tres Unidos was washed away in the flood. Thankfully the river was low enough that they could drive through it to get to the other side. The drive to Pairiso was uneventful but the moment they arrived to their destination another mudslide hit. Taylor had a split second decision to make- Do they abandon their mission to Paraiso and raise the mudslide down the mountain to cross the river again before it gets to Tres Unidos? or Do they continue on as planned and just trust that God will work everything out? Taylor decided to continue on with the plan in search of the man who lost his family. This man was on the family farm higher up the mountain when the disaster struck. He learned his parents, his wife, and their two children died when he returned to Pairiso. As you can imagine he was devastated. They were able to locate the man where his house once stood. Nothing was there except two rocks laid to mark the graves of his family. The youth group sang to this man and prayed with him. Taylor embraced him and tried to bring him the hope of Jesus Christ. Trying to console someone who had lost every earthly possession is extremely hard. What do you say to someone who has only his life and the clothes on his back? Without the Holy Spirit there is nothing you can offer him. The Holy Spirit gave Taylor the message He wanted the man to hear. The return trip was much more difficult because of the new mudslide but it was all worth it! Being able to bring a little comfort to a suffering man made all the struggles seem so easy. of the people who died during the mudslide. Please continue to pray for the people of Tres Unidos and Pairiso. There is still a lot of work ahead to rebuilding their lives. It will take many months especially now that we have entered the rainy season two months early. The community of Tres Unidos will need to rebuild their church as well. Please pray that the help and support they need will come. Our hope is to continue to journey with the people over these upcoming months since there are no missionaries currently living in that zone. The people of Tres Unidos trying to dry whatever they had left. because the church needs to be taken down due to a missing wall. The river crossing before the mudslide. A house frame is the only thing left standing. The special forces arrived to help bring supplies and to rescue people. The waterline on the house is where the dark brown meets the light brown. It is over the door at about six feet. The youth handing out donations to the people of Pairiso.